Summers in Lake Tahoe offer some of the best weather to be found anywhere in CA. Sunny, warm and clear days are the norm, with cool evenings making temperatures just perfect for all types of outdoor activities. Along with the usual hiking & biking, boating and swimming, there are all sorts of special events on the calendar to add highlights to your visit to Lake Tahoe. Summers in Lake Tahoe offer some of the best weather to be found anywhere in CA. Sunny, warm and clear days are the norm, with cool evenings making temperatures just perfect for all types of outdoor activities. Along with the usual hiking & biking, boating and swimming, (and on…), there are all sorts of special events on the calendar to add highlights to your visit to Lake Tahoe. There are whimsical plays by Shakespeare, Free and World Class Music concerts, Food & Wine events, Celebrity Golf, and always something more.... There’s always something fun to do in Lake Tahoe, whether you're in the mood to dress up to the nines, or just go casual. Let the adventures continue! Each summer, Sand Harbor comes to life with the characters of The Bard. 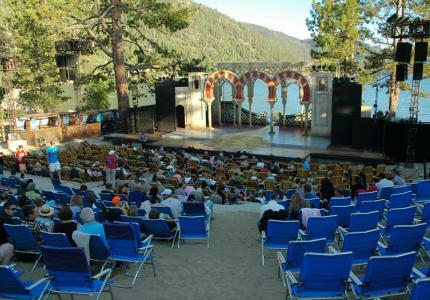 The Lake Tahoe Shakespeare Festival features one or two of his famous plays from mid-July until the end of August. Participants view the play from comfortable chairs (or VIP seating) from the sands of the beach with the sunset over Lake Tahoe as a backdrop. Other events are available including productions by the Reno Philharmonic Orchestra, the Sierra Nevada Ballet and local Chautauqua groups. Hot Tip: You are allowed to bring your own picnic and wine to the events—or you can partake of several culinary options including Ye Olde England-themed food booths. As the largest golf event in Lake Tahoe, this popular week features famous golfers, celebrities and sports stars from around the country. Players like Joe Theismann, Emmitt Smith, Bode Miller and Charles Barkley arrive at the Edgewood golf course on the East Shore to play for charity. At each of the events, visitors can get up and personal with the celebrities and tickets only cost between $15 and $25 per day. Hot Tip: If you have a boat, you can anchor it right off the beach and watch the players from the comfort of your own deck. If you are into the costumes and cosplay of the Renaissance, Camp Richardson in South Lake Tahoe comes to life with jousting, lance splitting, merchants, and lovely royal ladies during the Valhalla Renaissance Faire each June. Over 1,000 actors and four stages of events are available for viewing along with food vendors, children's games, minstrels and jugglers. Hot Tip: There is no need to dress up to visit the Faire, but it's encouraged, and fun! Get into some role playing! The Sunday evening Concerts at Commons Beach in Tahoe City is the largest live music event series in North Lake Tahoe and features bands from all over the West including the Trey Stone Band, Leche de Tigre and the California Honeydrops. Food booths, vendors and activities for kids are also available. The concerts are free, so these are popular events and parking fills up fast. Hot Tip: Get to the beach early to stake out your space. There are also shows at Lakeview Commons Beach in South Lake Tahoe - Thursday evenings 4:30- 8:30. Every first Friday of the month, the small historic town of Truckee offers complimentary art, food, drinks, music and more. It's like a big block party! Participating shops will display First Friday flags so you know where to go. Special promotions, sales and activities for children are available. Hot Tip: Special parking outside of town is available for the First Fridays events. 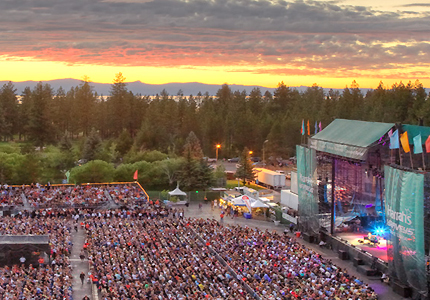 From June through August, Harvey's Lake Tahoe in Stateline brings in some of the hottest names in entertainment for their popular outdoor summer concert series. With acts by Carrie Underwood, Lady Gaga, Toby Keith, the Eagles and more, these concerts attract thousands of people. Tickets for Reserved seats are sold online months ahead of time. Food and drinks are sold at the event. The event may start out with warmer weather, but when the sun goes down, be sure you have a jacket or sweater for cooler temps. Hot Tip: The Harvey's parking garage can become quite congested after the concerts - recommend parking in another garage, on the street a few blocks away, or take public transportation. The Foothill Farmer's Market is a regional market that also comes to the Tahoe City and Truckee area. Each Thursday you can load up on fresh fruits and veggies in Tahoe City at Commons Beach or in Truckee near the train station. Dozens of vendors are at the event with local produce, food, drinks and arts and crafts. Even though the word "Autumn" is in the title, this early September event still enjoys very summer-like weather. Held at the Northstar Ski resort near Truckee, this Festival is three days of delicious gourmet cooking, food demonstrations, culinary competitions, and of course wine tasting! Farm to fork dinners, vendor fairs, and wine and beer walks are a part of their annual schedule. Hot Tip: Many of the events are free, but some (like the dinners) require advanced tickets. 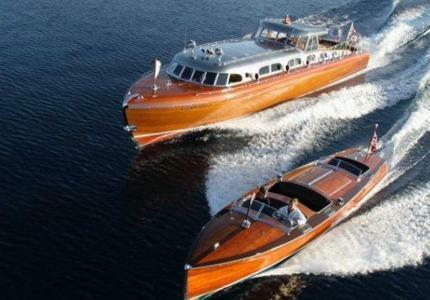 If you want to be out on the water, do it in style during the Concours d’ Elegance event in August. This boat show is centered mainly on restored historical wooden boats (Woodies) featuring some the most beautiful crafts on the Lake Tahoe. Starting at (the also historic) Obexers Boat Company, there is live entertainment, food, exhibits and awards ceremonies throughout the event culminating in an old fashioned boat race on Lake Tahoe. Luncheons and special dinner events are also planned. This event is a fundraiser that contributes generously to local charities. Hot Tip: Tickets for the event can be acquired online, and kids under 12 are FREE. This Food and Wine festival in August pairs local farmers with chefs who create food samples for the public—which are then paired with the perfect beer or wine. This event is full of local food, farm tours, winemaker dinners, live music and entertainment, and an spectacular evening fireworks show. Hot Tip: Many of the events are free, but get your tickets early for the winemaker dinners, they tend to sell out.